Happy Birthday USA! This year, for the first time, you will be able to celebrate our country’s 239th in Georgia with fireworks, legally. Who doesn’t love fireworks? Your pets. More pets are lost over the 4th of July holiday than at any time of the year. Pets get spooked by the loud noise and run off. Even if they are kept in a fenced in area, they get agitated enough, they will find any way they can to escape. I have posted a lot each year about keeping your pets away from fireworks displays, whether it’s a big, formal fireworks show in your town or just shooting off firecrackers and things in the neighborhood. With fireworks sales being legal now in Georgia since Wednesday, I thought I may need to do it again. Not all dogs are affected by fireworks. If your dog gets scared during thunderstorms, there’s a good chance it will get spooked by fireworks. Make sure you keep your dog in an inside part of your house. That way it’s harder to get out and it’s harder to hear the fireworks as well. Also play some relaxing music if possible. That’s another way to try and drown out the sound of the blasts. Don’t leave the TV on a regular channel. Put it on a soothing music channel. It’s also a good idea to exercise your dog during the day, so it will be tired and ready to sleep. Nearly all pets have a safe area in their homes. That’s a place they go when they are scared. It could be a closet, a corner, a bed or under the bed. If you know where your pet’s safe place, great. If not, test your smoke alarm and see where the pet goes. This is good to know, because if there is a fire or something in your house, you won’t have to waste time looking for the dog, you can go to the safe area and get it. It’s great to celebrate America’s birthday with family and friends. Pet owners love to have their pets with them and usually that is part of the fun. But this is one time where it may be best to leave the pets behind. Keep them where they are safe and comfortable and won’t be spooked and can’t run off. Nothing spoils a celebration like having to look for a lost pet. Regardless of your opinion of weather forecasters, the National Weather Service got this one right. The day that could be the hottest day of 2014 is Heat Safety Awareness Day. 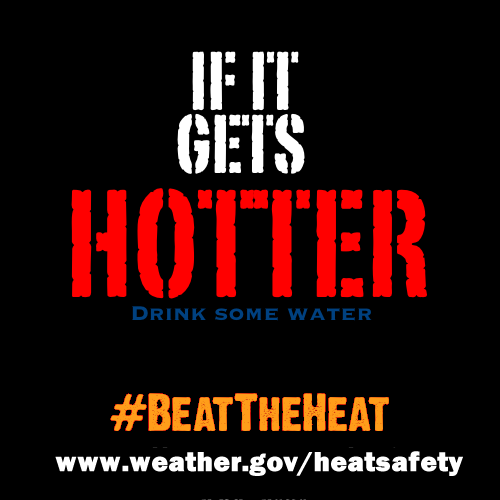 You can follow that link to a lot of great information about heat, how it affects you, and what advisories and warnings the NWS issues. Memorial Day is the unofficial beginning of summer, too. You probably have outdoor plans for the holiday weekend. If you are including your pets in those plans, I have some suggestions to keep the weekend enjoyable for everyone. It’s important for you to take care of yourself on a hot day because if you begin to succumb to heat when you are walking your dog, you are putting your dog in jeopardy. Many of these things involve common sense. You shouldn’t take your dog on extended walks during the hottest times of the day. Not only can the sun get to them, but the hot asphalt can damage their paws. Try and stay on grass or concrete sidewalks. 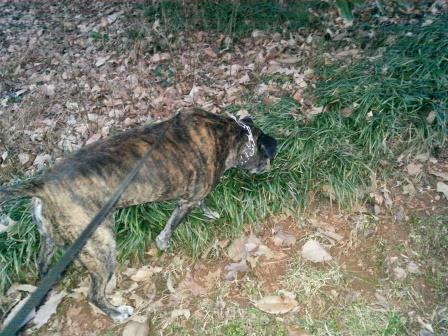 Of course, grass can be dangerous if it’s been treated with fertilizer or pesticide. If you are lucky enough to have a shady trail available to you, great. You shouldn’t be running during the hottest part of the day, but you want to run then, don’t take the dog. I’m sure you know that dogs cool off by panting because they don’t sweat. When they are breathing hard because they’re tired, it’s even harder for them to cool off. Other than that your dog is pretty much like you and it needs a lot of water. Portable bowls are available that can fold up in your pocket or attach to your belt. You can share a bottle of water this way. 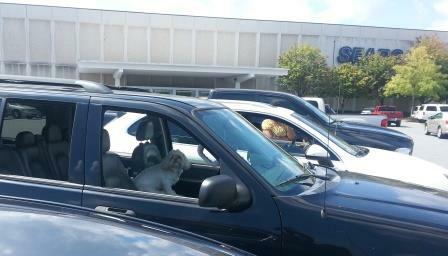 I hope I don’t have to tell you not to leave your pet in the car, but I took this picture in early September last year, on a very warm day. The NWS has some great information about how quickly temperatures can rise in a parked car. You can’t do it, even for a short time. Another important thing to realize is that breeds with pug faces, bulldogs, pugs, etc. are even more susceptible for heatstroke and even in moderate temperatures. Okay, you’re following directions; you’ve moved the long walks to the cooler times of day, you’re getting your dog plenty of water, but being out in hot temperatures is unavoidable. How will you know if it’s getting heatstroke? The most obvious symptom is uncontrollable panting. It may also start to foam at the mouth, become agitated or lethargic and even vomit. First Aid for heatstroke in your pet is to reduce its body temperature. Typically the first thing you do when performing first aid on a dog is to muzzle it, so it won’t bite you. However, when a dog is muzzled, he can’t pant, so only use that as a last resort. Ideally you want to give it cool water to drink, spray it with a hose, and get it in a wading pool or something. You don’t want the water to be too cold, because it could shock the system. You can also wrap it in a cool, wet sheet or towel. You should get it to your vet as soon as possible. This doesn’t have anything to do with the temperature, but dogs can get sunburned. White skinned dogs or dogs with thinning hair are most susceptible to sunburn. Keep these dogs under cover. One of the great things about owning a dog is being outside with it in the nice weather. Just be aware of the conditions, use common sense and keep a close eye on your pet and you won’t have your afternoon ruined by an emergency trip to the vet. Now that all the green beer has been consumed and the green shirt you wear once a year has been restored in the mothballs, we can get down to the serious event of the week. 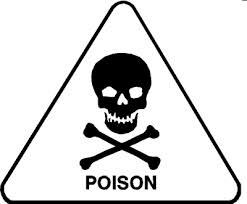 Poison prevention week. Pet owners may be surprised of all the items that are toxic to pets that are lying around the home. You don’t have to throw everything away, or spend all day reading all the labels on everything you buy. There is plenty of good information out there to make your home safe for your pets and maybe even the rest of your family. I found this blog from the Oregonian in Portland, Oregon that has a list of many of the items that are dangerous to pets. You may not even be aware that some of the most toxic items can be your houseplants. I have a client that has a cat and dog, and when I’d go over there to walk the dog, I could tell the cat had eaten some of the leaves on plants and had gotten sick. Lilies are especially dangerous. Here’s a list of plants that are harmful to pets if ingested. There are many dangerous things in the kitchen too. Dog owners know what spots on the counter are not safe from their dogs. It’s harder to keep things away from cats because they can get almost anywhere. That’s why it’s important to know what is dangerous and to keep it in the pantry or a cabinet and that those doors are kept closed. If you smoke, it’s important to empty your ashtrays. You don’t want to leave cigarettes lying around either. Second hand smoke is toxic to pets just as it is to humans, so you may want to do your smoking in a place where your pets can’t go. The Pet Poison Helpline has a great website with a lot of wonderful information about making your home a safe environment for your family and your pets. If your pet does ingest something that you are afraid could be dangerous to it, they have a number to call for help. There is a $39 fee for this, but it includes follow up calls. You may want to put the number in your phone: 800-213-6680. It is monitored 24/7. As you do your spring cleaning, keep some of these tips in mind and you may find some things that can be easily fixed. Hopefully you’ll never need to call the hotline. This is another instance that preparation can prevent a problem or at least make it less likely to happen. I hate to say I told you so, but I told you so. I doubt very seriously that anyone from the Durham Bulls baseball team has ever read my blog, but maybe they should have. I posted a story last month about how many dogs get spooked by fireworks and run off around the 4th of July. Many of these dogs never make it back home and wind up in shelters or worse. 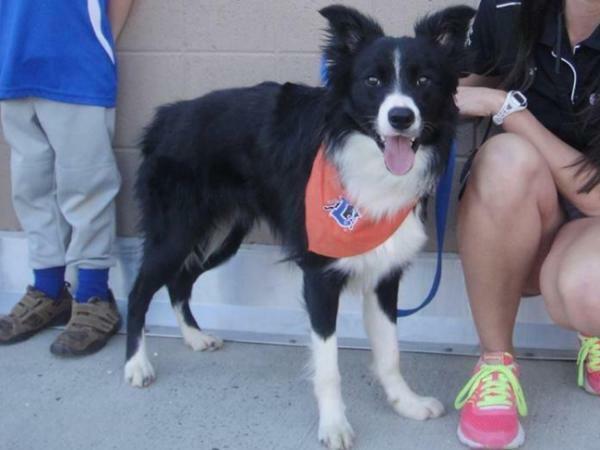 Today I came across this story about Deuce, a 1 year-old border collie that runs the bases during Bulls games along with his brother Ace. After the game, the dog’s owner, Gene Lonsway, was putting the dogs in his van when the fireworks show started. Ace was in the van okay, but Deuce was spooked and ran off. As of Tuesday morning he still hadn’t been found. Lonsway says he hopes Deuce ran into one of the nearby neighborhoods and was picked up by a family. The story has gotten a lot of attention in the Durham area, so hopefully it will have a happy ending. I’ll keep you posted. Please be careful if you’re using fireworks around your pets. You never know how it will act when it is exposed to a new situation, especially if it’s stressful. Lonsway is apparently an experienced dog trainer who has been providing dogs for the Bulls for several years, so it can happen to anyone. Here’s a link to Deuce and Ace in action. Today (July 15) is National Pet Fire Safety Day. The American Kennel Club started the day 3 years ago to spread awareness about how pets can start fires and how to prevent them. Pets can also be victims of fires they didn’t start and preparation can help firefighters to save them. The National Fire Protection Association estimates that 500,000 pets are affected annually by home fires each year. Nearly 1000 house fires are accidentally started by pets inside the home. The AKC website has some tips to try and reduce the risk of your pet starting a house fire. Most of them are pretty obvious and the first is to not have your pet unsupervised around an open flame. 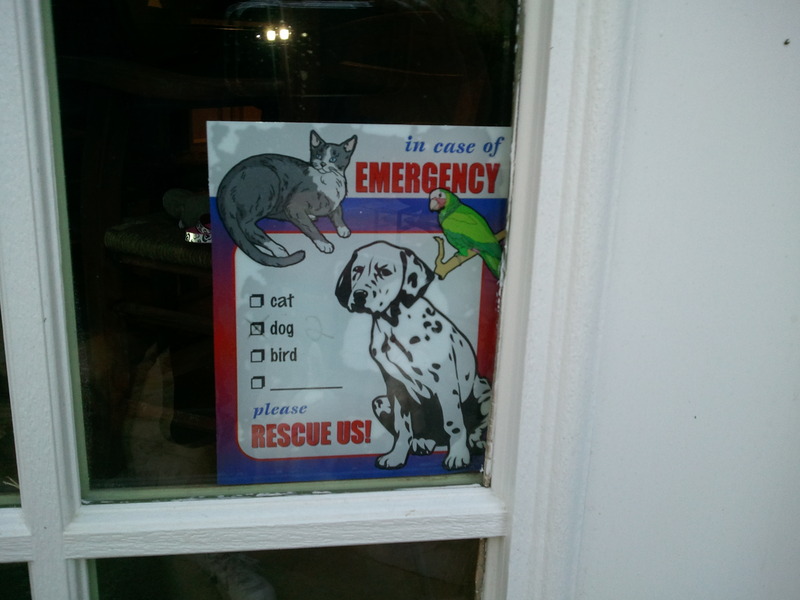 One other thing today does is to increase the awareness of the importance to have cling signs at the entrance ways to your home letting fire fighters know how many pets are in your home. It’s best if you can put how many of each type, like 3 cats and 1 dog. If you don’t have these on your home already, they are available at most pet stores. Two links in the AKC article on Pet Fire Safety Day that said you could get free signs from the National Volunteer Fire Council and ADT did not provide that info. If you are served by a volunteer fire department the signs may be available at your local firehouse, but you may want to call them in advance. You also want to know where your pet’s safe haven in your house is. This is where your pet goes when it’s scared. If you don’t know, or want to double check, test your smoke alarm and watch where it goes. If you can put this on the cling sign, it gives the rescue workers a place to go and they won’t waste time looking for your pets. These seconds could make a difference in them being able to save your pets. Why are these hot days called the dog days of summer? Your dog seems to not want to spend very much time outside because it’s so hot. This time of year gets its name because this is the time of year that Sirius, the dog star and the brightest star in our sky beside the sun, is visible in the Northern Hemisphere. Sirius is in the constellation Canis Major, one of the hunting dogs for Orion. Orion, the hunter, has the well known three-star belt that is so visible. 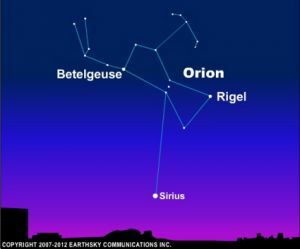 Sirius is visible below Orion in the pre-dawn hours right now. Whatever the reason, it’s no doubt hot outside and it’s not very comfortable for your dogs. Be sure to limit their time outside, and try and walk them on dirt or grass instead of the asphalt. 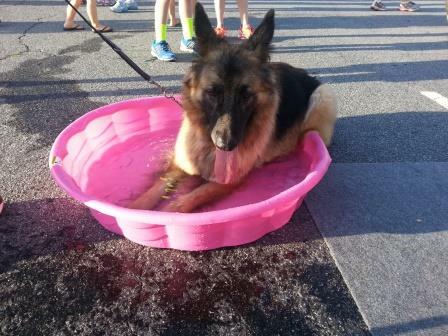 One thing you can do to cool down your dog before you take them out is to run water over them. You can use water from a hose, or if you don’t have a hose, a squirt bottle with water in it can be used to spray off their underside. This is a very effective way of cooling down the animal. The water doesn’t have to be very cold either. This works well after the walk and it’s not as messy when you let them back in the house. Get them to rise up on their back legs and you can give them a couple of sprays of water. Some of you may use a squirt bottle for discipline with your dog, so you may need to find another way to wet it down without confusing it.